The pea aphid is one of the most common insect pests found in pea and lentil in the Palouse. The mature adult is small, about 1/8+ inch long, and pale green. For more on the biology see The Pea Aphid and Important Viruses it Vectors. In Idaho, pea aphids can become very abundant in some years, reaching densities capable of causing direct injury to the crop, and reducing yield, even in the absence of viruses. The aphids injure the crop by sucking sap from the stems, leaves and pods, depleting resources required to set and fill the seed. Very high densities (Fig. 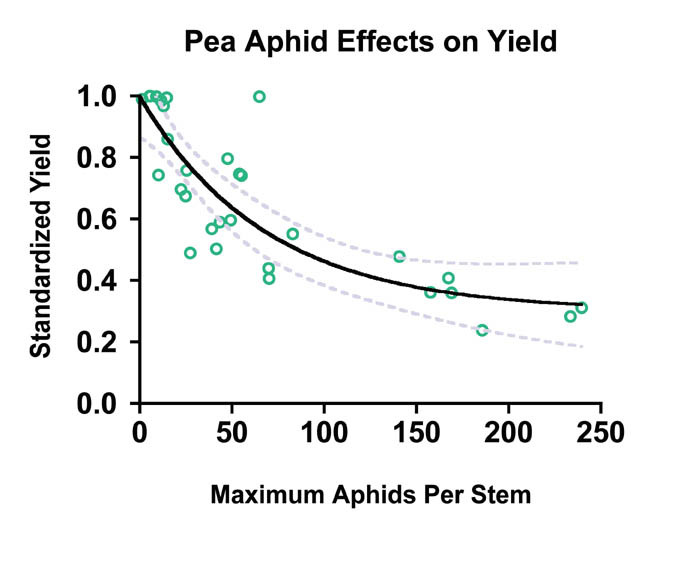 1) can reduce yield; approximately 50 aphids per stem can reduce yield in pea by 50% (Fig. 2). To prevent aphids reaching these damaging levels the standard practice has been to treat with insecticides when the economic threshold of 30-40 aphids are collected per 180/ sweep of a 38 cm (15 inch) diameter insect net, (2) when few natural enemies are present, and (3) when aphid numbers do not decline over a 2-day period (Homan et al. 1991). In years when aphid population growth is slow and virus is not suspected, insecticide treatments for aphids can often avoided entirely or are not required until well into the growing season, near flowering. 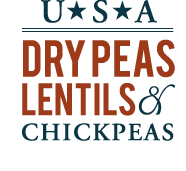 Although these recommendations have been developed for pea, they are approximate for lentil as well. For specific information on the insecticides registered for use to control pea aphid, see the following relevant sections of the Pacific Northwest Insect Pest Management Handbook: Dry Edible and Seed Pea Pests, Pea Aphid. The pea aphid is more difficult to manage when it is vectoring disease causing viruses. In the Palouse region, these include Pea enation mosaic virus, Bean leaf roll virus, Pea streak virus, and Alfalfa mosaic virus. The first two have been by far the most prevalent in recent years. These two viruses are persistently transmitted by the aphids. This means that they must be ingested with the sap from an infected plant, pass through the gut wall of the aphid and be taken up by the salivary glands of the aphid. From there they can infect a new plant when the aphid feeds on it and injects saliva. Once infected, the aphid can transmit virus for life. Newborn aphids are always virus free, but acquire the virus soon after feeding. It takes an aphid several hours to acquire these viruses and it is capable of transmitting within a few days of acquisition. These delays in time to acquire persistently transmitted viruses provide the produce a cushion that can allow virus spread to be reduced by suppressing the aphids with insecticides. In addition, Pea enation mosaic virus and Bean leaf roll virus are not seed born so they must be carried into the crop by aphids from distant sources. If aphids are detected in the crop and are suspected to be carrying viruses (viruliferous) aggressive and early treatment can limit virus infections to the crop plants first colonized by the aphids. In other words, so called 'secondary spread' of the virus from initially infected plants to the rest of the crop can be limited. It is difficult to determine if aphids are viruliferous. Virus symptoms are slow to develop, so once these are detected it is too late to achieve much protection by spraying the crop. 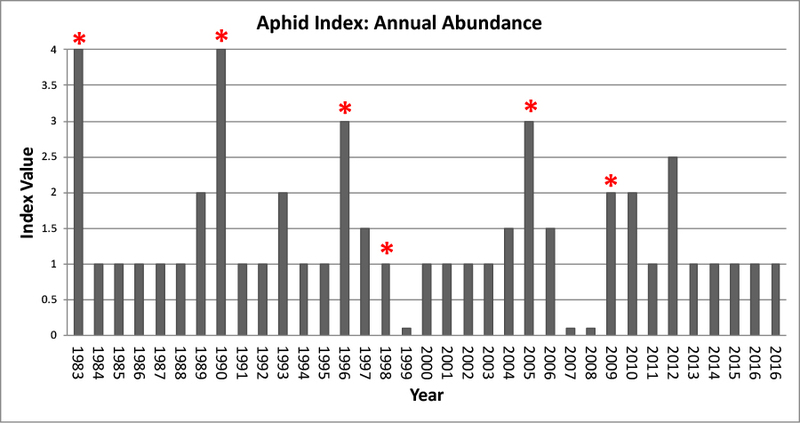 Virus epidemics have always occurred when aphids are unusually abundant (see Aphid Outbreaks Since 1983, below). If aphid populations are developing especially rapidly, based on your experience, it is prudent to control them because of the risk of virus. As part of this Legume Virus Project we are collecting data on the occurrence of virus in immigrating aphids, as measured using a laboratory technique. In future years, as information is acquired, we expect to be able to issue calibrated estimates of the risk of virus in pea and lentil based on these data. In 2006 and 2007, viruses occurred in only a small proportion of the immigrating aphids we captured entering the crop (<5%) and there was little or no evidence of virus disease or presence of virus in the pea crop. We expect that on some years virus will be more prevalent in immigrants - possibly the majority of aphids will be viruliferous - and that on such years producers should plan to treat aggressively. To find out the prevalence of virus in immigrating aphids for a given season go to Locations & Data, where we will be posting information within a few days of capturing aphids in traps located throughout the Palouse region. The graph shows the occurrence of aphid outbreaks in the Palouse since 1983. The index is generated by sampling approximately 10 pea fields throughout the region at intervals during the first part of the growing season. For this index, a value of 0 approaching 1 = aphids absent or 'few' counted on plants; 1 approaching 2 = high counts (peak averages of 10–99 aphids per plant) in 26–50% of the sampled fields; 2 approaching 3 = very high counts (peak averages >100 aphids per plant) in 51–75% of the fields; and 3 approaching 4 = peak counts averaging >100 aphids per plant in 76–100% of the fields (Clement et al. 2010). The very high aphid densities that characterize index values 3–4 represent outbreaks. Clement, S. L., D. S. Husebye, and S. D. Eigenbrode. 2010. Ecological factors influencing pea aphid outbreaks in the US Pacific Northwest. Pages 108-128 in P. Kindlmann, A. F. G. Dixon, and K. Houdková, editors. Aphid biodiversity under environmental change: patterns and processes. Springer, Dordrecht. Eigenbrode, S. D. and H. Ding. 2006. Pea aphid control, 2005 Arthropod Management Tests 31. Homan, H.W., R.L. Stoltz, and D.J. Schotzko. 1991. Aphids on peas and lentils and their control. University of Idaho, Cooperative Extension Bulletin No. 748.